Shortly before noon on July 2nd, the Federal Court ordered the government to suspend the deportation of the Buzas family, which was scheduled for the following day. The stay came in the context of a public campaign, including widespread media coverage. The family learned the good news at a public support rally calling on Minister Alexander to stop the deportation. A huge thank you to all who wrote and called the Minister of Immigration, participated in the press conference and rally, worked on the legal file and provided reports and research. The support that came together around the Buzas family was impressive and inspiring; a model of what a Solidarity City can look like. The family’s struggle is unfortunately not over. The Federal Court granted an emergency stay until the Court further decides whether it will hear two issues: the constitutionality of the one-year (and in the case of so-called safe countries like Hungary, three-year) bar on pre-removal risk assessments; and the legality of proceeding to deport someone before their application for permanent residence on humanitarian grounds is decided when a serious question of the best interest of a child is at stake. If the family wins, their file will go back to the Canadian Border Services Agency. If the family loses, a new deportation date will be set. However, at any time before these legal questions are settled, Minister of Immigration Chris Alexander can make things easy by simply reading and accepting the family’s application for permanent residence on humanitarian grounds, which they submitted last December. This is not even a question of the Minister exercising discretionary power, it is simply a matter of doing his job. Please email or fax the Federal Minister of Immigration Chris Alexander and urge him to respond to the family’s humanitarian application as soon as possible and no later than 1 September. A model letter is available here. OPRE ROMA! STATUS FOR ALL! NO ONE IS ILLEGAL! Renata Buzas and her husband Tibor, their children Tibor (13), Mercedesz (11) and Lili (9) are of Roma ethnic origin and fear to return to their native Hungary, where racist violence against Roma and Jews is again on the rise, in a context of long-standing, deep-rooted discrimination. Renata herself was violently attacked by two racist men in the presence of her son Tibor, who was deeply traumatized by the incident. This was the last straw for the family and they decided to leave Hungary. In Hungary, the three children were bullied and ostracized as Roma. In Montreal, they have made friends and found confidence. Importantly, Tibor (13) and his sister Lili (9) have finally received the support they need to address language development difficulties that did not receive necessary attention in Hungary. Despite the widely documented violence and discrimination against Roma in Hungary, the Canadian government maintains that the country is “safe”. The family has lived in Quebec since 2011 and applied for permanent residence on humanitarian grounds in December 2013 after being refused as refugees. If they are deported, the minister no longer has any legal obligation to respond to their application and in practice deportees are not accepted. 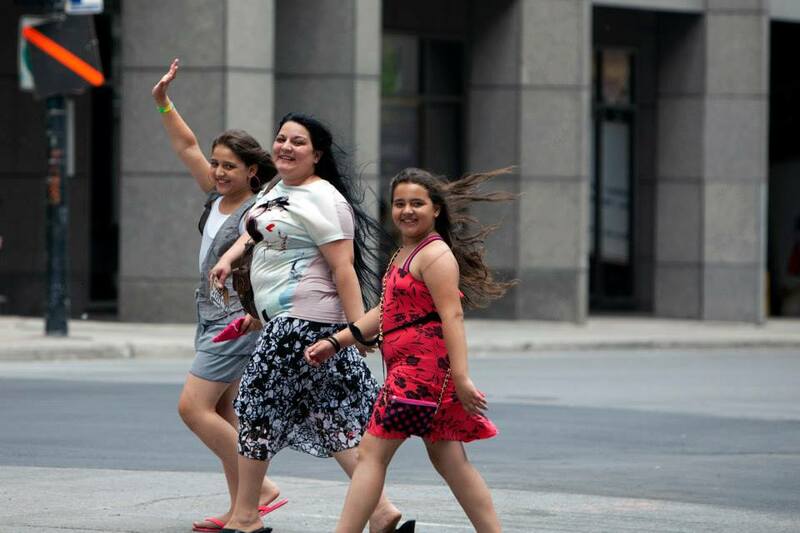 Renata Buzas brought her children to Canada to protect them from the discrimination and violence against Roma that she experienced her entire life in Hungary. Canada is trying to send them back, before their application for permanent residence is even decided.